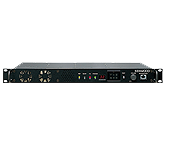 Kenwood's high-performance analog repeater can be programmed on up to 32 channels. Used most often as an exciter unit and mated to a high output power amplifier, this unit can also be used as a full-duplex base station. The TKR-740/840 includes flash memory capability, is PC tunable, and it's convenient test and auxiliary ports make this unit easy to maintain even at a remote mountaintop site. The high-spec and serviceable TKR-740/840 is the first choice for demanding industrial and public service applications.